Morning at Lake Sally Ann was peaceful. 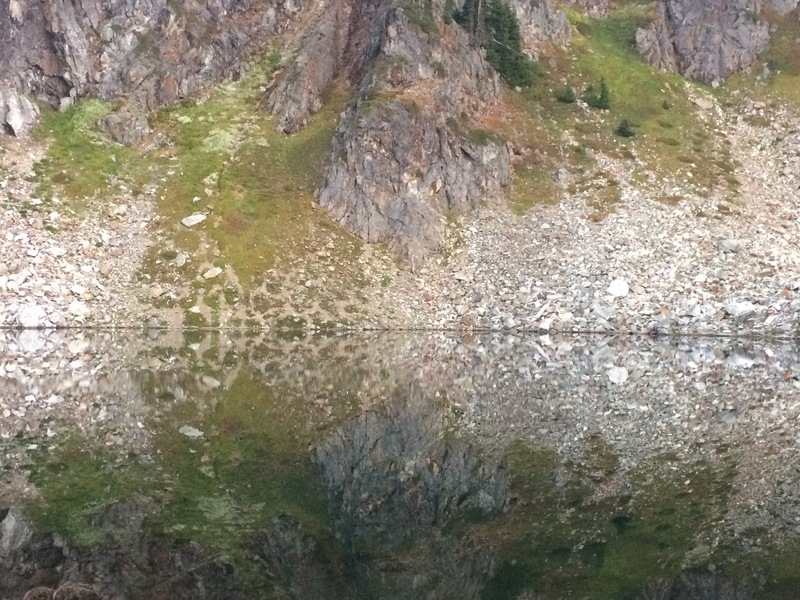 The lake’s surface was still, glass like and the rocks on opposite site reflected in beautiful abstract patterns. I even took the tripod out to get few photos in the still dim light of the dawn. First part of our day took us on Cady Ridge and around Kodak Peak. The familiar views with Glacier Peak were heartwarming. 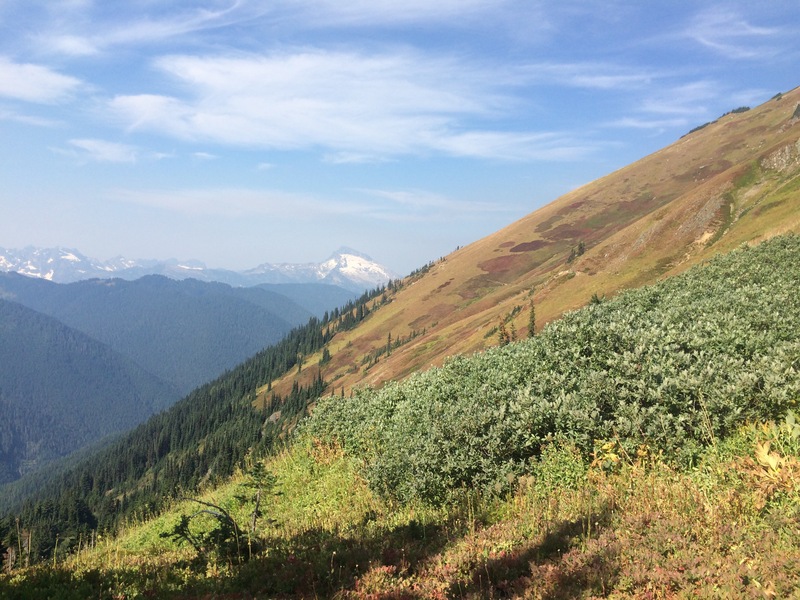 Shortly after skirting around the base of Kodak Peak the trail took us into Glacier Peak Wilderness and for the next few miles we enjoyed new territory which included peaks along Mt. Loop Hwy, our frequent playground, fall colored slopes, and Reflection Pond which really was not reflecting all that much. Short distance further we found ourselves on a small climb to White Pass. 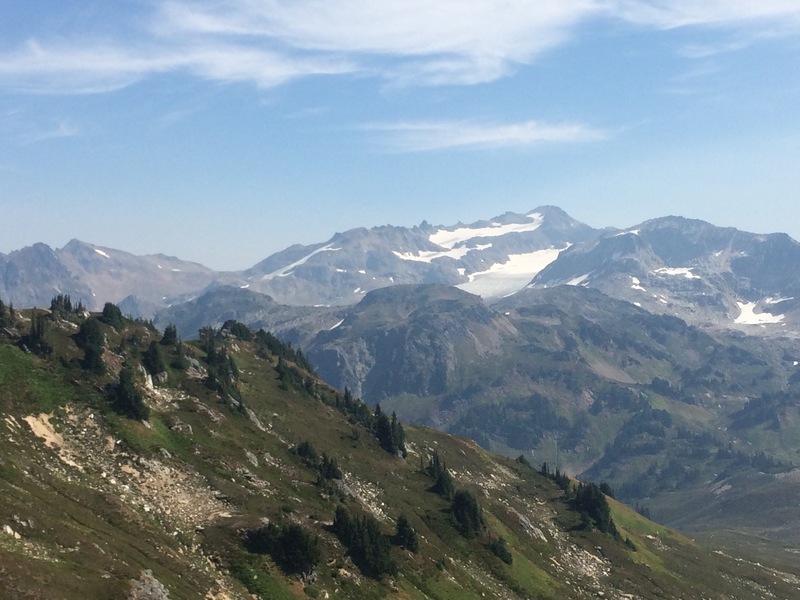 We met group of three climbers resting here who summited Glacier Peak yesterday. We rested at that very same spot before and after our climb as well. The rest of day was completely new to us. We climbed up for more views, unfortunately there was more smoky haze today, and then down for a long time before forest swallowed us in the mid afternoon. The forest was pleasant for a while, mossy green along the trail just as if fairies lined it, but as soon as we hit the bottom, we had to navigate through swamps and unabridged creeks. It was time consuming but the biggest hurdle was still ahead. After a 300 foot climb we started our last descend, short downhill to a large creek. We could hear it’s roaring stream from afar. 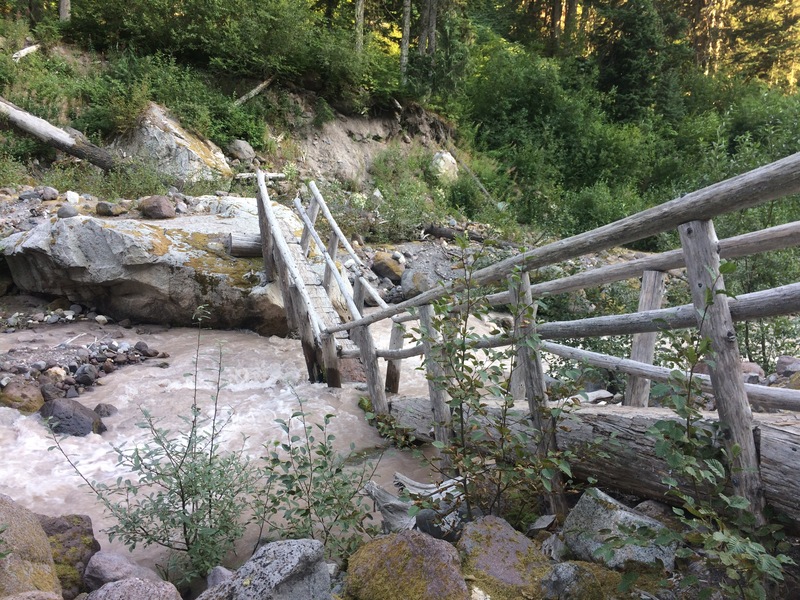 The downhill was a nightmare of downed trees, small washouts, overgrown trail, and at the very bottom when we reached the creek, we found the bridge broken in the middle with water gushing over the collapsed part. The other side was steep, one of the steepest slopes we faced on the trail, but at least it was more friendly in the term of obstacles. We made camp at 6:45, much later than we hoped for, and before chores were done it was dark outside. Hopefully tomorrow the trail will be smooth and obstacle free. Washington is not giving us a day to rest. 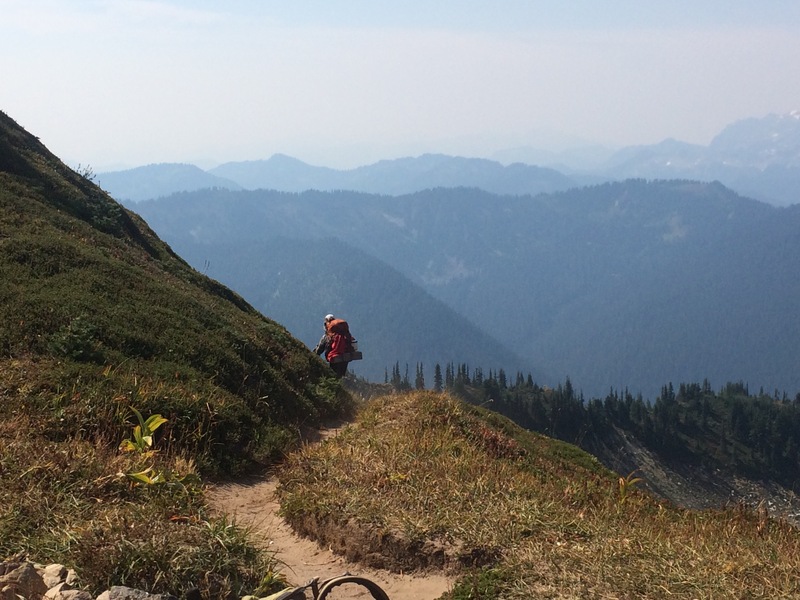 6,500 feet of elevation gain lays between us and our next camp.